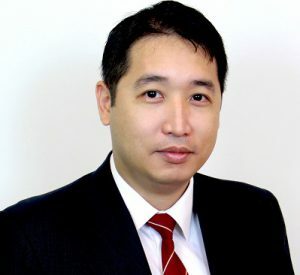 The choice of acquiring in Australia (instead of Singapore) does not come as a surprise, as the manager had repeatedly articulated its portfolio rebalancing strategy of acquiring in Australia. In our recent results report on 19 January, we had also opined that the manager is now in a better position to execute that strategy, following the recapitalisation of the balance sheet. Freehold lease in Australia, resulting in a more stable asset value. This is in contrast to Singapore, where industrial land leases are 30 years or less – which has the effect of declining property valuations as the remaining land lease shortens. 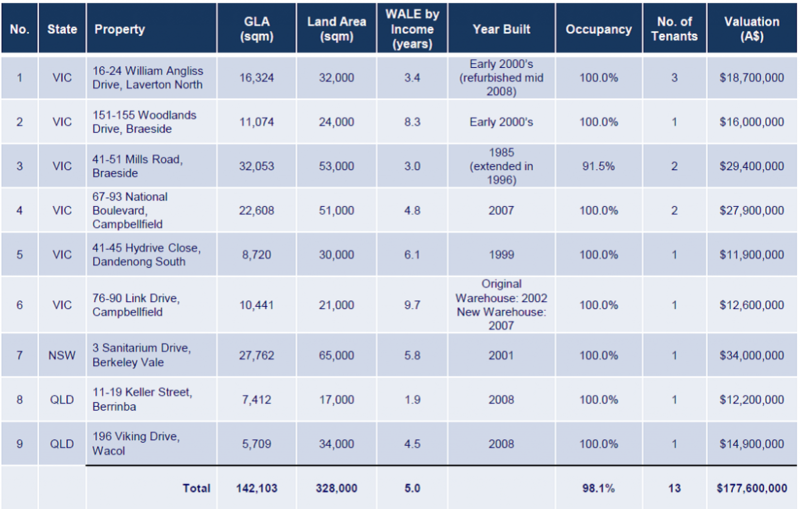 Improves diversification of income source by geography, tenant and properties. Australia contributed 16% of gross rental income (GRI) in FY17. On a pro-forma basis, this will increase to 24% following the acquisition of the nine properties. The top 10 tenants contributed 80.4% of GRI and will be lowered to 68.5%. Overall portfolio value increases from S$1.21bn across 19 properties to S$1.40bn across 28 properties. Extension of portfolio WALE. 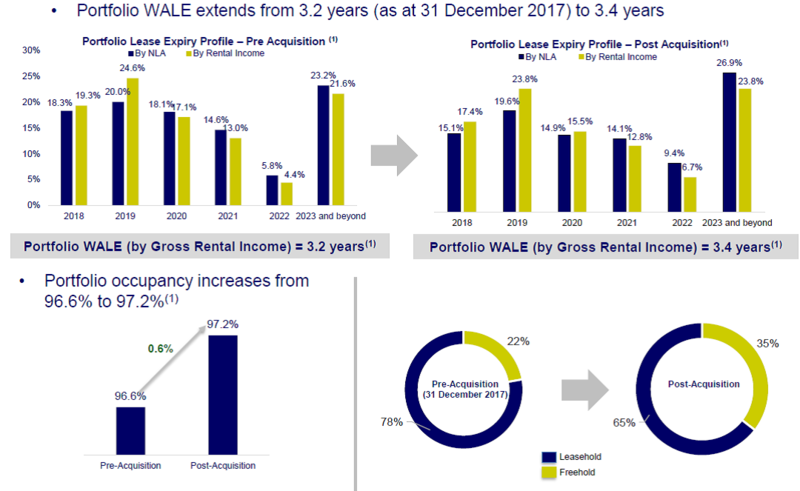 The nine properties have a weighted average lease expiry (WALE) of 5.0 years (by GRI), which extends Cache’s existing portfolio WALE from 3.2 years to 3.4 years. DPU accretive to unitholders. There will not be any new units created, as the acquisition will be funded by S$110mn term loan facility and S$100mn 5.5% p.a. perpetual security. Only slight DPU accretion, despite portfolio value growing by 15.6%. NPI will receive a boost (~S$12.05mn), but income available for distribution to unitholders will face leakage of S$5.5mn p.a. due to the coupon of the perpetual security. Interest expense and manager’s fees are also expected to be S$4.6mn higher, resulting in less than S$2mn actually flowing down to unitholders after withholding tax. Nonetheless, gearing remains manageable, as we estimate it at 35.8%, following this acquisition and proposed divestment of 40 Alps Ave. (Gearing as at end of FY17 was 36.3%.) We also estimate ~$96mn debt headroom (assuming 40% cap), which can be used to further grow the portfolio. We have raised our FY18e/FY19e revenue assumption by 10.8%/12.4%, and DPU assumption by 1.4%/1.7%. Our FY18e DPU assumption is still -6.8% YoY despite the acquisition, due to the combined effects of the larger unit base from the 18-for-100 Rights Issue in 4Q17, absence of income due to the divestment of 40 Alps Ave, conversion of CWT Commodity Hub to multi-tenancy lease, and negative reversions along the backdrop of ongoing softness in the Singapore rental market. Cache Logistics Trust is under-valued relative to logistics peers in terms of P/NAV multiple. Its above peer-average trailing yield suggests that there is room for yield to compress.